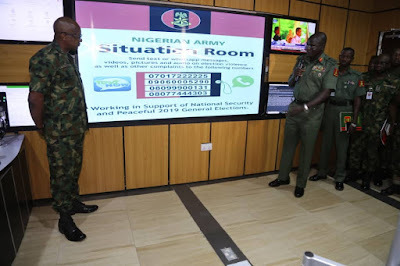 The Chief of Army Staff Nigerian Army (NA), Lieutenant General Tukur Yusuf Buratai has today Wednesday the 13th of February 2019 launched Elections Monitoring and Security Situation Room with the view to safeguarding and strengthening Nigeria's democracy. The launching/commissioning ceremony was done at the NA Cyber Warfare Command at the Army Headquarters Abuja. In his remarks at the occasion, the COAS stated that -"As a stakeholder in safeguarding Nigeria's democracy, the NA requires real-time security situational awareness regarding the electoral processes nationwide in order to be well positioned to adequately respond, should the need arise". "The security situation monitoring solution acquired by the NA for this purpose, has been designed to avail a clear security situation during the electioneering period", - he added. "Let me also use this opportunity to reiterate the total commitment of the NA under my leadership to a free, fair, transparent and credible 2019 elections", he further added.